Miss your desktop so much that you can’t spend a minute without looking at it? Or, do you need to access your desktop without getting up from the couch? In either case, remote desktop applications come in very handy here. The ‘magic’ happens thanks to a proprietary (ugh!) technology developed by Microsoft (not again!) called Remote Desktop Protocol. 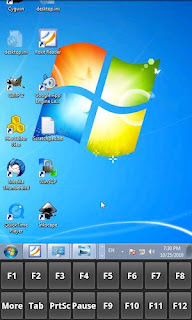 This allows users to access another computer’s graphical interface remotely. Open source implementations of RDP have allowed other operating systems like Linux to use the technology in their own desktop computers and even mobile devices. Thanks to the relative openness of the Android platform, users can now remotely access their desktops even from their smartphones. This feature might not seem that important to average users; however, for many techies who frequently help their friends and families with their computer woes, this is one of the handiest tools around. So, if you’re looking for some great remote desktop applications for Android, then read on as we discuss the best ones that are out there in the market. When it comes to Remote desktop software, TeamViewer is one of the best apps out there. The application lets you access your Windows, Mac or Linux desktop from your Android smartphone even while you’re on a call. With complete support for gestures, this application gives you full-featured access to your desktop even through Firewalls and proxy servers. The installation is simple; just download the app for your Android (1.6 or above), then, install the desktop application (available across Windows, Mac and Linux). Enter your TeamViewer ID and you’re good to go. TeamViewer uses highly secure technologies to ensure that no one but you has access to the service, making it one of the most reliable RDP apps around. The application is free to install, but the service requires you to buy a license. Even though a bit on the expensive side, it is much better than its competitors as it allows you to buy lifetime licenses thus getting rid of the hassles of recurring billing. 2X is a free RDP client for Android that lets you access your desktop from anywhere. Though it works only with Windows, 2X gives you full access to your computer in a secure way. You get a full screen experience with handy touch and gestures support. 2X also allows you to directly access published Windows applications right from the app. The app is free and it works on Android 3.0 and later devices. Splashtop Remote is a remote desktop app for Android that gives you full access to your Windows or Mac computer. The app not only allows you to view your desktop, it also lets you access Outlook, use PowerPoint, watch videos and even play 3D games. This powerful application can also connect to multiple computers at once making it one of the most popular Remote desktop applications out there. Splashtop Remote connects over Wi-Fi with a minimal one-touch setup. 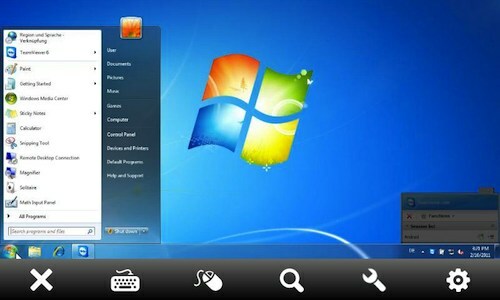 The desktop can then be controlled from the phone using gestures and touch controls. Rated 5 stars by The New York Times, Splashtop Remote Desktop is not free, but as of now, the developers have lowered the price by 50%. It is recommended that you have a high-end Android device and a dual-core CPU on your desktop. Remote Desktop Client by Xtralogic is a remote desktop software that lets you view and control your Windows desktop using RDP. It is the only Remote Desktop app that supports Microsoft Remote assistance and comes with a lot of interesting features. Once connected, you get to change the screen resolution and color depth (8 bit through 32 bit color support) to make the viewing experience as native as possible. The app securely connects to the desktop using SSL and supports Network Level Authentication (NLA). Remote Desktop Client also comes with a fully functional keyboard, pinch/zoom support and copy/paste between client and server. Another great thing about this application is that it connects to the desktop without the need for any server-side software. For now, it supports many Windows desktops out of the box. However, when connecting to a Linux or Mac OS X computer, you’ll need to enter the settings manually. The app is not free and is rather on the expensive side. So, you wouldn’t want to buy it if you’re looking for a remote desktop app just to play around with. That said, Remote Desktop Client is an application that will be extremely useful for people who use the feature frequently for their work.